The chokecherries are planted for their beautiful spring flowers and in the case of ‘Schubert’, their contrasting purple foliage. I do not recommend that my clients plant ‘Schubert’ and Mayday trees as they tend to be short-lived, disease-prone, and generally unhealthy unless they are planted with care and well maintained. ‘Schubert’ chokecherries are among the most widely planted landscape trees on the Prairies. Late winter is ideal on the Prairies, although they can be pruned anytime provided no more than 10% of the canopy is removed. In warmer, more humid climates, it is best to prune this genus after flowering to prevent possible infection of the fungus that causes silverleaf. Train young trees as a central leader standard. I prefer to start my main scaffold branches at about 4’ above grade. These are multi-branched trees and I manage the overall form of the tree, rather than subordinating co-dominant leaders. Chokecherries are often the most severely damaged trees during a late spring snowfall, when the leaves have already emerged. It is important to thin the tips and properly reduce the width or end-weight of the tree properly (See Width Reduction). The most commonly damaged chokecherries that I encounter have had their interior branches removed, but no pruning attention has been made to the outer canopy, and as a result, it becomes top or end heavy, and readily loses its form during late snows. Branches that are severely bent by snow load do not recover well, and additional pruning is required to train the tree to an acceptable form (See Storm Damage Restoration). Amur cherries have a self-destructive structure that must be addressed early on in the tree’s development, otherwise severe included bark will develop, leading to the failure of large limbs. Amurs are one of the species that I most commonly brace with bolts. Such bolting is injurious to the tree but prevents limb failure. Drastic measures such as bolting and cabling can often be prevented with proper structural training. Remove deadwood each season. ‘Schubert’ chokecherries sucker readily from the base of the trunk. Amur cherries will sucker when stressed. Remove all suckers at their origin each year. Black knot is the most common disease of chokecherries and infected branches should be removed each season. Make sure to cut the infected branches back at least 6” from the end of the ‘knot’ or swelling. Insects are generally not a problem with chokecherries, however, aphids will attack in some years. Badly infested trees can be sprayed with insecticidal soap. Other contact insecticides are available from licensed pesticide applicators. Chokecherries do not tolerate ornamental crown reduction well and it is not recommended. In addition, crown-reduced trees are more susceptible to infection by disease-causing organisms, such as black knot fungus. Avoid planting chokecherries in low places that are subject to runoff. Also avoid over watering in your yard. 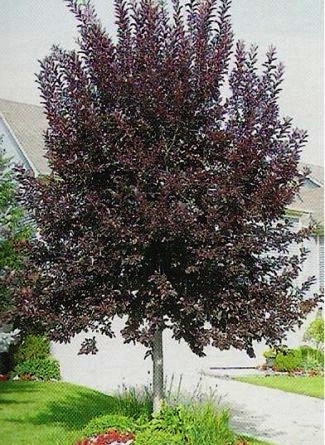 A well mulched tree should only require irrigation every 2-4 weeks in the summer. Signs of over-watering include: small, stunted leaves, washed-out purple coloured foliage, and reduced twig growth. Stressed, weak trees are also more susceptible to disease.